Heavy-duty, polymer loader makes it easy for you to load a 10-, 20- or 30-round magazine in less than 30 seconds. Load hundreds of magazines a day without the pain, pinched fingers, or bruises of hand-loading—perfect for military/law enforcement armorers, shooting ranges, and any high-volume AR-15 shooter. Standard model accepts USGI-type AR-15/M16 (NATO STANAG 4179) magazines; Universal also accepts other AR-style magazines, including HK 416, SAR-80, Beretta AR-70/90, plus Magpul PMAG, Thermold, Orlite, and SIG Sauer polymer mags. Foolproof design, with only one moving part, makes it impossible to load magazines incorrectly and requires no maintenance. 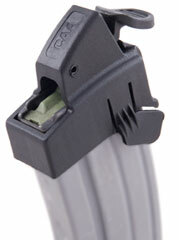 Feeds rounds into the magazine without contacting the feed lips, so it prolongs magazine life. Rounds are held securely in the tray and won’t fly out when the slider is moved. Numbered indicators show the number of rounds in the tray, so no more guessing how many rounds have been loaded. Convenient carrying handle makes it easy to take to the range; includes heavy duty padded ballistic nylon carrying case. The LULA™ loader & unloader is a military-quality personal magazine loader and unloader. It facilitates both loading of loose rounds into a magazine and unloading them out of the magazine. It does so fast, safely, comfortably and painlessly. Usable for tens-of-thousands rounds. 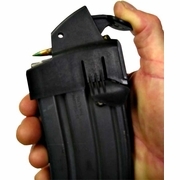 Thumb-saving, lightweight magazine loader provides fast, painless 30-round magazine loading in less than 13 seconds. Accepts 10-round stripper clips or loose rounds for easy loading of 10-, 20-, and 30-round magazines, and is capable of unloading a 30-round magazine in 15 seconds. Ambidextrous, grooved thumb slide provides a non-slip grip for right- or left-hand loading. Constructed of durable, reinforced polymer for dependable operation under extreme field conditions. Fits all AR-15/M16 metal and plastic magazines. Easy-to-use loader snaps over top of detachable box magazine to help you quickly and efficiently insert rounds without pinching, bruising, or cutting fingers and thumbs. 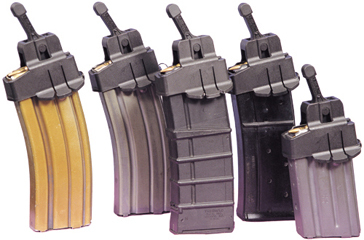 Lets you load up mags fast, so you spend more precious range time shooting. Wide thumb pad provides plenty of leverage to compress the magazine spring, even when close to full capacity. Quick-release tab locks into mag catch notch to prevent unwanted movement during loading. Fits any .223/5.56mm or 6.8mm magazine for AR-15/M16 and Ruger® Mini-14®, as well as STANAG-compatible mags. Rugged, molded polymer construction with a textured, no-slip surface.